Whether they are twice-exceptional, gifted and quirky, or just odd, you know you have a complex kid when the standard parenting advice or processes aren’t helping you and your family thrive and teachers, doctors, and other parents in your life don’t seem to understand your kid. Complex kids are hard to parent. 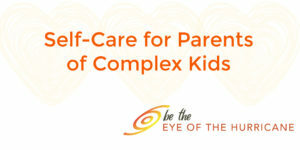 Without a foundation of self-care, parents burn out. Mainstream media messages about self-care focus on pampering and treats and involve tools or habits that take time and money. But these can hard to implement when parenting complex kids and don’t actually deal with the most important issues. You need tools that you can use quickly, in the heat of the moment, anywhere. You need custom solutions that fit in your life, with your kid(s) and your personality traits. Self-care for parents of complicated kids needs to include mental health care. Spending days, months, or years stressed by parenting challenges takes a toll on every aspect of your life: physical health, personal relationships, job performance, and overall happiness. use a coaching approach to reduce stress around parenting. These tools will provide a foundation you can return to over and over again. You will also have experienced a process you can use to make changes over time as your children grow and their needs and abilities change. Jen Merrill and Kate Arms have been there and they know how hard it is. You may have read Jen’s book, If This is a Gift, Can I Send it Back? or her blog Laughing at Chaos, in which case you know that she is the master of finding the funny in the hard times. She is currently working on a book on self care for GHF Press. Kate is a leadership and life coach with a focus on how to have the hard conversations that make family systems and organizations thrive. Between them, they have 6 complex kids between 11 and 17 and experience with homeschooling, private schooling, and public schools. They bring their professional and personal experiences to this class to help you figure out how to create a life that works for you despite the challenges. We will meet using Zoom software, which is an easy to use video conferencing software package. Instructions on how to use the software and connect will be sent after registration. Subscribe to our mailing list to be notified when the next sessions are announced.